2nd Grade Math Games Are Great For Teaching Kids Math Skills. Second grade math and and learning math facts go hand in hand. Here's a fun activity to help them get practice with their math facts. What you Need: Pencil and paper. You can print off the squares we provide to get you started. Each player gets a grid to start with. You can print the grids that we have provided to get started. We have also provided a blank grid for players will fill the top row and left column at the start of the game. 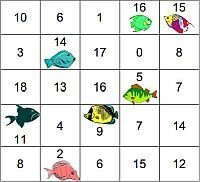 All of the players will start at the same time and fill in the missing squares to complete the math facts. 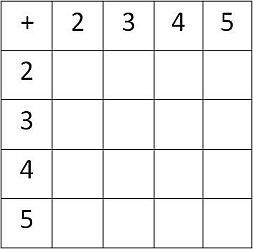 The first player to fill in all of their squares correctly is the winner of the game. You can have them play several rounds to complete a game, or have a winner after each round. You decide which math facts they need to work on most, whether they be addition, subtraction, multiplication, or division. There are plenty more math games for 2nd graders to enjoy here. Here's another addition math game they are sure to enjoy. You can see a picture of the game board over on the right. You can print off the game board we provide and you're ready to go. Make sure you check out the main second grade math games page at the link below. You'll also see the elementary math games link as well.